I think it would be better to turn this into something which relates to the OP and then maybe something useful can come out of this. Cladking, take a look at the phrase I framed in red. 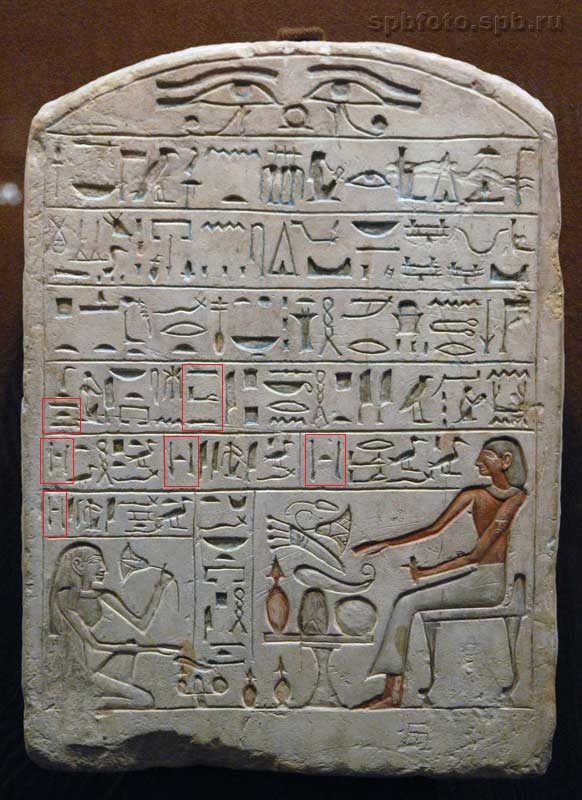 This is hard to read if you don't know the meaning, which is very common, but the symbols are not clearly shown in the this photograph posted by eyeofhorus33. That's why I am helping out. I think this is the best part, as it pertains to your OP, of this sterotypical dedication of which there are many. These inscriptions are otherwise actually pretty concrete in meaning so this doesn't help you much. Phonetically, this phrase reads "Mact kheru" and it literally (which is what you are pursuing) means "true/just voice". The "ramp" symbol means justice (or order) and the logogram for that is actually the feather symbol which also symbolizes "Shu". The oar symbol means voice. The irony is that you brought up all these objects and eyeofhorus33 then posts a stele where this comes up at least as symbols. So here might be a good discussion point for you all to weight the literal and the abstract meaning one might glean from this phrase. I understand you are charging that Egyptian texts should not be read with the imagery of the Book of Dead and similar metaphysical interpretations in mind, because you believe that imagery fuels a sense on the part of modern day translators that words have double and triple meanings and say more than meets the eye. You are opposed to this view from what I understand. You believe the words have only one layer of semantics. What you read is what it means. You are saying this should be read, if it can be read, as what it says: Just Voice. Another more extreme view might insist this should be read logographically as Ramp-Oar...let's just put it all on the table. I assume you accept that it's phonetic, but maybe I am wrong. The commonly accepted way to read this, the way you are saying is wrong, would read this as "judged" or "justified" which is based on the imagery of the Egyptian afterlife...the deceased's heart is weighed and if it is lighter than the feather, s/he moves on to spiritual bliss. So there you have it, two ways to translate it, concrete and abstract. How do we choose and is that choice justified or is it imposed? Take it away. One entry for you Cladking is the fact that you recognize that "Shu" is air and feather is light. You want to read it as rising up and if you think about it that is also the way the Egyptian concept of the weighing of the heart works...the light heart free of sin moves up on the scale of Mact. Maybe you and Warwick and Eyeofhorus33 can find some common ground there. Edited 1 time(s). Last edit at 17-Apr-18 22:55 by Manu.